Years ago when I was a young Army lieutenant, my reconnaissance platoon was preparing to conduct a night-time helicopter insertion far behind enemy lines to seek out intelligence critical for a large-scale operation to be conducted 48 hours later. The operation was high risk. That night as I back-briefed my Troop commander over the hood of a Humvee in the German woods, I expressed my concern about the level of danger the platoon was facing. At that time the war in Iraq was still over a year in the future, and the risk was largely hypothetical, but I wondered whether the Army would really risk a brigade of 3,000 to 4,000 soldiers and hundreds of armored vehicles to rescue a few men in a desperate situation. And then I didn’t think about it again. That is until I was leading men in a real war in Iraq. In November of 2006, my Cavalry Troop was in the process of moving from Tal ‘Afar in northwest Iraq to Taji, a large operating base just outside of Baghdad. The night before our movement, a special operations team had been conducting a raid deep in the al Qaeda-controlled hinterlands of the infamous Anbar province. The raid had run into trouble and a large force of al Qaeda fighters was closely engaged with the small special operations team. A pair of Air Force F-16 fighters scrambled to provide air support for the troops, but because the fighting had moved to such close range, they could not use their normal load of bombs without risking the lives of the men they were trying to save. With no good options, one pilot, Major Troy Gilbert, volunteered to conduct a highly-dangerous low-level night-time strafing mission in order to employ his aircraft’s 20mm cannon which could be used much closer to friendly troops. On completing the diving attack, his plane was unable to pull out in time and crash landed in the Anbar desert. Although he had been unable to eject, the aircraft was largely intact and it was possible that MAJ Gilbert had survived. On that chance, my Troop and over two thousand other US combat troops—an entire Army Brigade’s worth – were quickly dispatched to rescue the pilot. We had just arrived in Taji and had not even unpacked, when we sortied into the desert. The area had never been under US control and the roads were littered with large and deadly Improvised Explosive Devices (IEDs). The going was slow and occasionally punctuated by the ambush of al Qaeda fighters. We reached the crash site and then searched the surrounding desert and villages for four days until we were able to find forensic proof that MAJ Gilbert had not survived the crash. After an extended search other soldiers were able to locate and bring home his remains. During those nights in the desert, I remembered another night in the German woods and realized that I was helping to fulfill a promise made not just by my commander, but by millions of American soldiers over hundreds of years. The risk MAJ Gilbert accepted was extraordinary. As an experienced pilot, he was fully aware of the danger and the cost he might have to pay to save the lives of a few Army soldiers. Our mission to find MAJ Gilbert was the most dangerous we had conducted up to that point. As we rolled out into the desert, we also knew the risks and willingly accepted them—also at a cost. 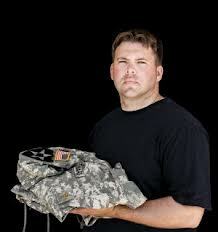 In my unit, Corporal Billy Farris, also a young father, was killed in an ambush during the operation. What stands out about Troy Gilbert and the incredible men and women I had the privilege of serving with was their belief in the infinite value of the life of another soldier. What is exceptional about Kristof’s statement is that he made it after I had been provided the top level of care available within the DOD and VA medical systems—a level of care only a few hundred service members a year were given access to. However, these alleged best efforts were only a façade. Suffering from daily, debilitating pain and unable to function in most facets of life including interacting with my wife and our four children, I began to seriously consider suicide. That was when Stand for the Troops came to my rescue and joined me in my personal battle against the invisible wounds of war. They arranged for me to receive several months of Hyperbaric Oxygen Therapy (HBOT) from one of the leading practitioners in the country, Dr. Paul Harch at Louisiana State University (who provided the treatments for me at his own expense). It was the first genuinely effective medical care I had received since returning home, and it has restored much of my life. Today I am a productive and contributing member of society, with a loving family and a high quality of life. As we reflect this Veterans Day on the blessings derived from the service and sacrifice of so many men and women and their families, we begin to realize the magnitude of the task before us in living up to legacy heroes like MAJ Troy Gilbert. I am pleased to report that there remain many great Americans, both in and out of uniform, who share the belief in the infinite value of a soldier’s life. Please join me in supporting Stand for the Troops in making sure the nearly one million veterans disabled by TBI and PTSD finally get the genuinely effective care they deserve.